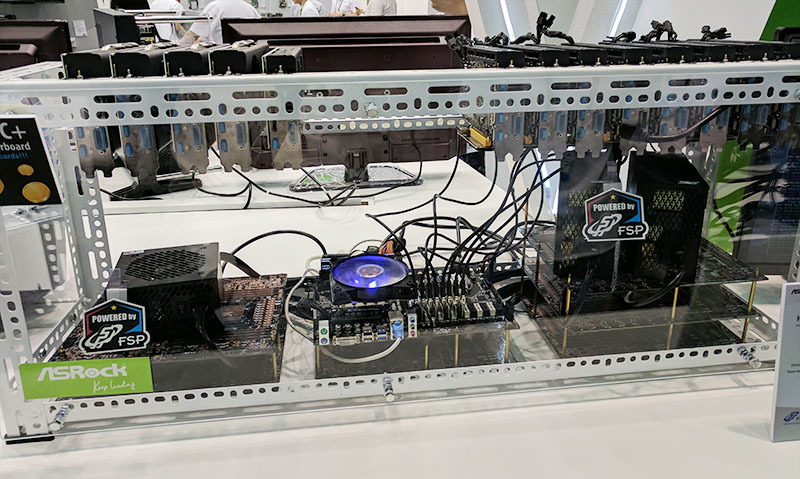 STH was at Computex 2017 and while touring the Nangang 4F hall on three different days, there were two booths that had a substantial amount of traffic: ASRock and MSI. 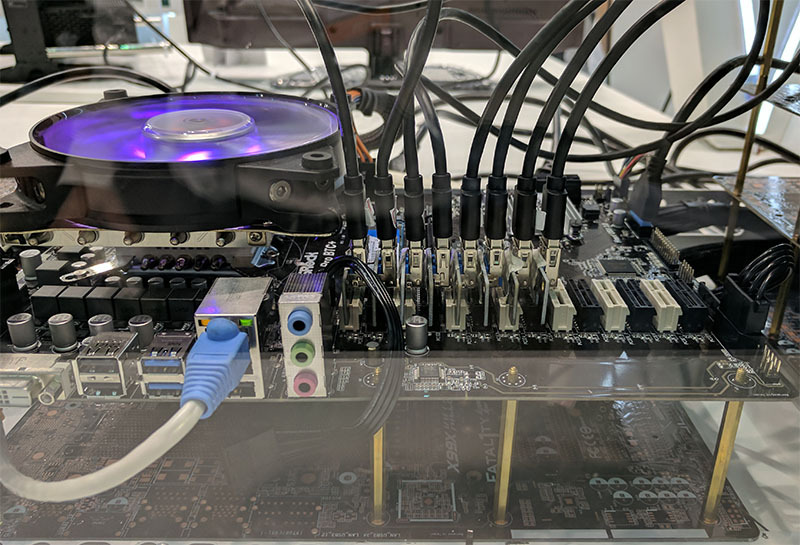 While many of the motherboard manufacturers were showing off X299 (Intel) and X399 (AMD) motherboards that drew crowds, ASRock and Biostar had rigs mining Ethereum and other altcoins that garnered large crowds. 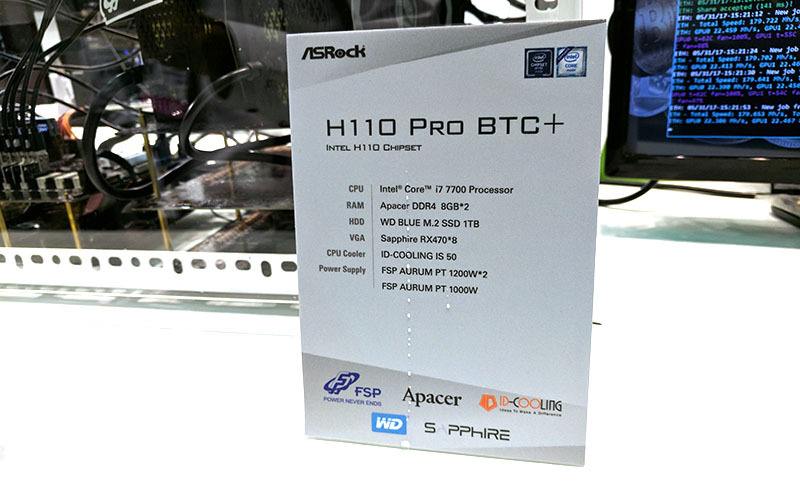 Perhaps the most interesting display was a 14x PCIe motherboard, the ASRock H110 Pro BTC+ which was mining with 8x GPUs on the show floor and “earning” over $30/ day doing so. Ethereum is the number two (or three depending on the day) cryptocurrency at the time of this writing. While Bitcoin may be the best known, Ethereum has about half the market cap of Bitcoin and is seeing broad adoption. That makes the total value of outstanding Ethereum over $20B at the time this is being penned. There are plenty of in-depth pieces out there on mining mechanics, but the easiest way of conceptualizing mining is being rewarded for providing some compute capacity for transaction processing. In return, one receives Ether which then can be traded for Bitcoin, traditional currencies, or goods/ services. Unlike Bitcoin where mining is dominated by ASICs, Ether can be mined efficiently using modern GPUs. As a result, many mining setups seek to maximize the number of PCIe x1 slots that can be found on a platform. Since the power used and therefore heat generated can be significant, utilizing cards with non-reference double width (or more) coolers is common. 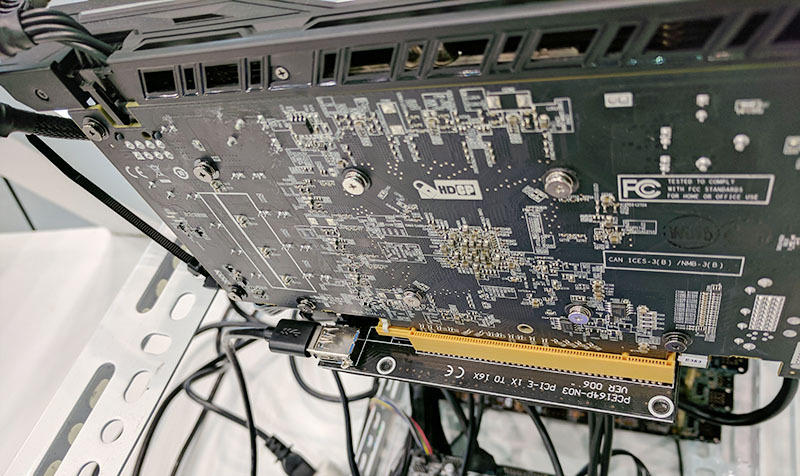 It is extremely popular to place GPUs on PCIe x1 risers and then mount the GPUs away from the motherboard. Here is the placard showing 3.2kW of PSUs which were more than the show floor was providing for the demo. The demo had eight GPUs running so there were eight PCIe x1 to x16 risers installed leaving six slots open. 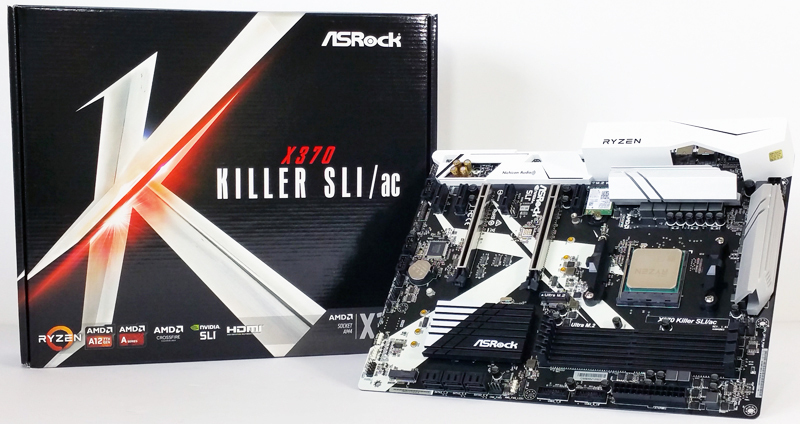 The PCIe x1 to USB to PCIe x16 riser assemblies are very popular with miners. 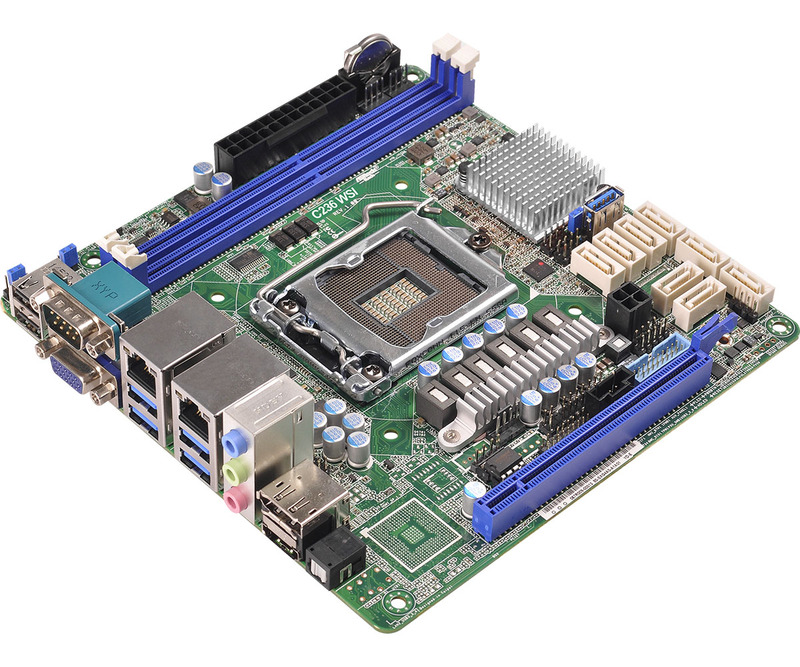 The ASRock demo was using PCE164P-N03 risers which you can get on Amazon. 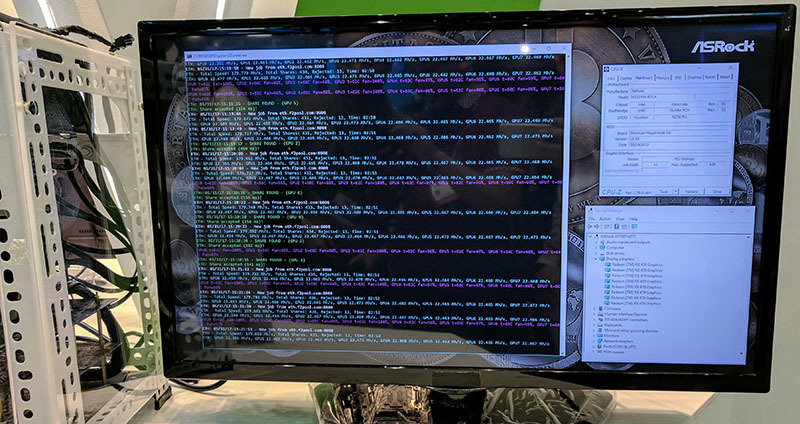 The demo was live on the show floor with 8x AMD RX 470 cards with a total of almost 180 Mh/s performance. For those wondering, that is approximately worth $30/ day at the time of this writing. While the H110 chipset may not be an enthusiast’s dream for gaming, the low-cost platform is ideal for these sorts of mining rigs. The overall cryptocurrency market has bubbled to being worth over $90B USD at the time of this writing which is more than three times the market cap of HP Enterprise. It makes sense that we are seeing more mining specific hardware as the currency values rise and the mining market grows. The STH forums recently added a crypto mining subforum. We also have a number of Docker images for Monero/ Zcash mining on Linux clusters. Of course, we have been hard at work benchmarking hardware on common CPU/ GPU platforms. How hopeless is windows? still unable to do more than 8 gpus. $30/day doesn’t sound like a lot, not knowing the power draw. Have you tried Tensorflow on this rig? I know the PCIe 1x connection would bottleneck transfers, but in some cases if all the memory transfers could be transferred in advance, it might be possible to get decent performance. I think the struggle is that nobody will want to spend money on a system that has such a slim use case for deep learning. Frameworks and methodologies are always changing so it is helpful to have more coverage. 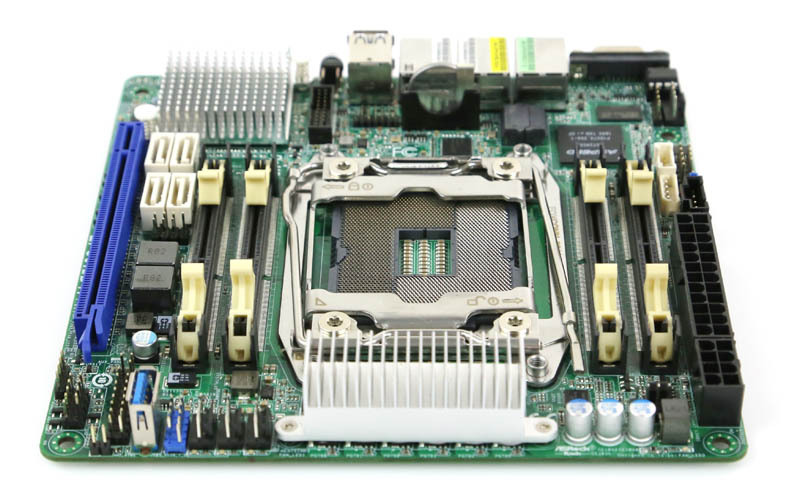 can the m2 slot be also used as pcie with the proper equipment?